The Writer's Chatroom presents multi-genre novelist Kerri Nelson. Welcome, Stacie, to Reviews and Interviews today. 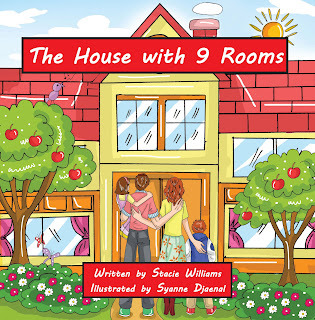 Congratulations on writing and publishing your first children's book. I'm glad to have you here to share a bit about your work. Please introduce us to you with a brief bio. I am a stay-at-home mom of 2 kids: a 4-year-old boy named Nicholas and a 2-year-old daughter named Savannah. I'm also a writer and wife. 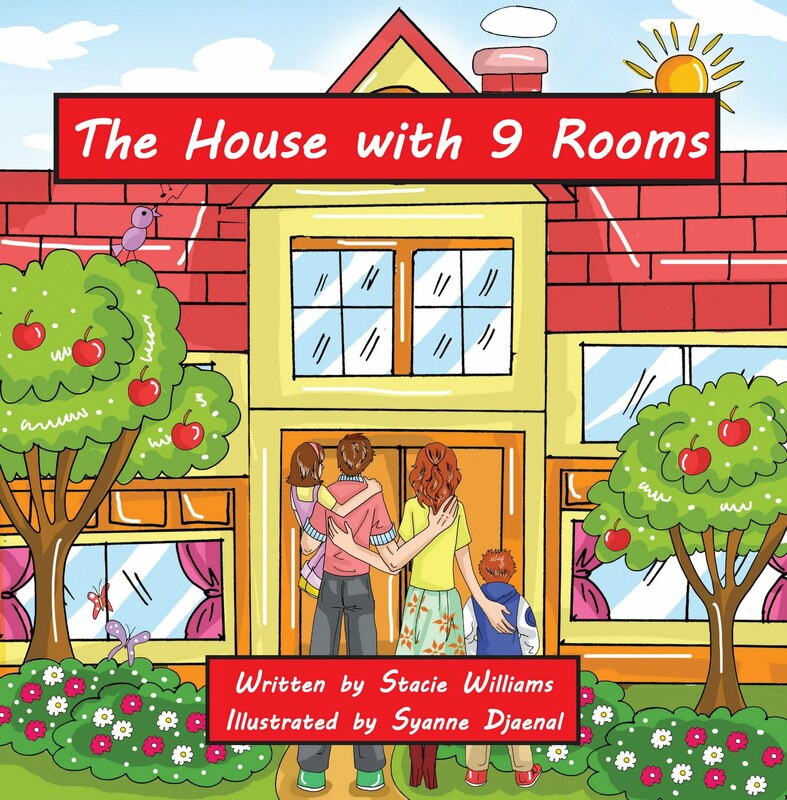 This story is about a house with nine rooms. When you enter the house, it feels magical. You have different things in every room. It's a strange and wonderful feeling to be in the house. It's almost like a dream that you don't want to wake up from. There is something for everyone in every room, whether you're a man or woman, a boy or a girl. It is a wonderful house to be in! First of all, part of it was in my dream. Another reason is that my kids love books. Lastly, after reading the Twilight saga series, I wanted to write a book and publish it. I wanted people to be able to picture what they are reading and really enjoy it. I am working in a whole different genre - crime thriller. It's about an animal smuggling ring. Thats all I want to give away about it right now. I considered myself a writer when I was writing the book and once it got published. Do you write full time? If so, whats your work day like? If not what do you do other than write and how do you find time to write? Well, I don't write full time. I'm a stay-at-home mom and I clean the house and take care of my kids. I write when I can and as much as I can. If I feel like writing I do. Well, I don't think I have any, but I do like to research. I guess I dont think I can write unless I have every fact I can get my hands on. First, I wanted to be a vet, but then I couldn't put animals down when they were sick or dying. Also, I wanted to be a writer and CSI agent, but I'm glad I am a writer. Anything else that you'd like to share with the readers? Well, I want to share to always follow your dreams and heart no matter what. To keep reading and enjoy my book. Thank you. 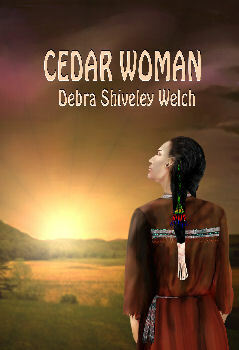 My book is available amazon.com, bn.com, and booksamillion.com. Readers can learn more about me through my blog, my Web site, and my family site. Thanks again for stopping by, Stacie. Best of luck with your adventure into crime fiction! The Writer's Chatroom presents thriller novelist Jamie Freveletti. 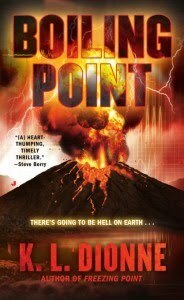 Today we're chatting with horror author Joe Pinto about his newest book that is not dark fiction. Please start us off with a short biography. I presently live in New Jersey with my wife, Stacey, and daughter, Athena. I'm also the author of the horror novel Flowers for Evelene. 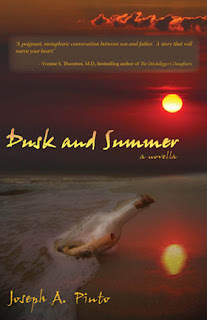 Dusk and Summer is my first work outside the horror genre. Dusk and Summer is utilized by the Lustgarten Foundation for Pancreatic Cancer Research as a "gift that keeps giving." In other words, with each purchase, a portion of proceeds is donated back to help raise money for a very worthy cause. As far as the book itself, it's the story about a dying father who sends his son on a last mission to bring his soul to rest at sea. It's an inspirational blend of fact and fantasy, based on my experience of my father's battle against pancreatic cancer. After my father lost his fifteen-month battle against pancreatic cancer, I needed a way to honor both him and his fight. He loved the sea; when I was little, he used to tell me about the wrecks he explored from his scuba diving days. There was one story in particular about a close call he had. Dusk and Summer was born from there. There are no named characters in my novella. I did this so that a wider audience could embrace the story. Whether you've lost a loved one or just looking for a deeper read, Dusk and Summer is not limited to any one genre. I'll be putting numerous short stories out into markets in 2011, as well as one already published in a horror anthology scheduled for an early 2011 release. 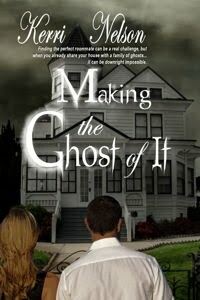 Then there's my new horror novel. I can't really divulge anything yet other than to say this is going to be a dark, dark tale. I caught the writing bug when I was a kid. I wrote short stories here or there, but always used the excuse "lack of time" as a reason why I didn't push myself. I finally reached a point when I said enough is enough and sat down and wrote Flowers for Evelene. I needed to prove to myself that I was capable of achieving the next level, and striving forward from there. I hope to be a full-time writer at some point. I own a small business, & I'm Mr. Mom every day for my 2-1/2 year old daughter, Athena. I love it, but it has its challenges. I don't use "lack of time" as an excuse anymore; I simply write during whatever free time I'm afforded. Everything happens for a reason, and I firmly believe I need to continue paying my dues until I'm ready for a bigger stage. Joe, maybe you're in someone's novel and don't know it! An author. I've always had a true knack to tell a good story. It wasn't until I was nearly thirty-five when I wrote my first book, and I thought I was a failure for waiting so long. Honestly, I was just feeling sorry for myself. I realized that I simply wasn't ready to push and take chances. Now, I'm confident that my goals and dreams are still ahead of me, and I know what it takes to achieve them. Sometimes, you must learn your own boundaries before exceeding them. Folks can check out my website and my blog to stay up with what I'm doing. Great interview, Joe. Thank you for stopping by. 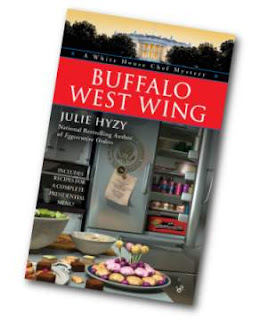 The Writer's Chatroom presents mystery author Julie Hyzy. Today I'm chatting with multi-published author Tim Hallinan. Tim, please get us started with a short bio. I'm the author of sixteen published novels, including the six Simeon Grist private eye books from the 1990s, the current Poke Rafferty Bangkok Thrillers, the most recent of which is The Queen of Patpong, published in August 2010, and a new series featuring Junior Bender, a San Fernando Valley burglar who moonlights as a private eye for crooks. 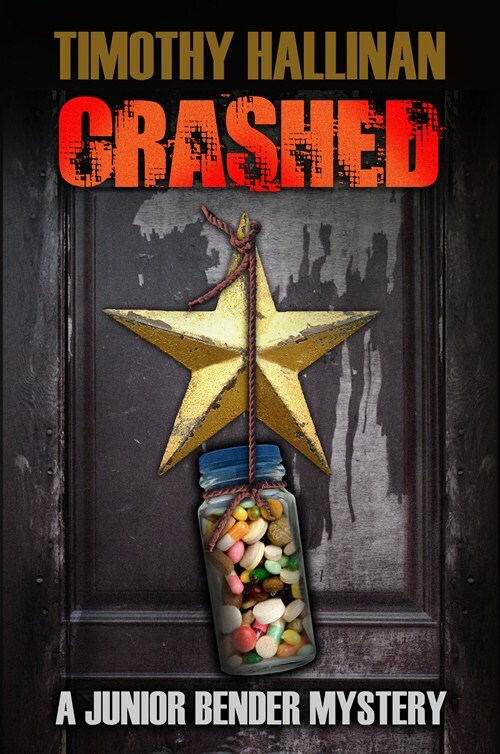 The first book in the series, Crashed, has just been made available for the Kindle and other e-book readers. I live in Santa Monica, California; Bangkok, Thailand; and Phnom Penh, Cambodia. I can tell this is going to be an adventurous interview. Please tell us about your current release, Crashed. I love writing series. I love taking a handful of characters through five or six books (or more) and imagining them not only while the stories are taking place, but also in between stories. After a while – with my Bangkok book, especially, I feel like I know what the main characters are doing all the time. I half expect to get letters and phone calls from them. The new series focuses on a completely different kind of character, someone I thought it would be fun to hang out with. Junior Bender has known since he was fifteen years old that he wanted to be a burglar. He's an elite burglar, mainly working on commission, doing jobs that have been scouted and set up in advance. He's also a little too smart for his own good, and he's accidentally fallen into a second career, which is being a private eye whose clients are all crooks, like him. When a crook gets ripped off, he or she doesn't call the cops. They call Junior. In the first book, Crashed, Junior is forced to take a job he normally wouldn't give a thought to – preventing sabotage against a big-budget “adult movie” starring a drugged-out 23-year-old who, when she was a child, was the biggest star on television. All his inclinations are to sabotage the movie himself and try to get the young woman some help, but his clients aren't going to sympathize with that sentiment, so he's walking a tightrope the entire book. I started hearing a voice in my head: a crook with a crook's view of the world, but also a moral view – at least, by his own standards. The voice was easy, street-level prose, and very, very funny. I was working on the third Poke Rafferty book, Breathing Water, at the time and on deadline, but I put it aside for a while. Two weeks later, I had the first 40,000 words of Crashed. I went back to finish Breathing Water, took a few weeks off, and refocused on Crashed. The first draft was done in three more weeks, making it the fastest book I've ever written. Junior just wouldn't let go of me. So I wrote the next (current) Poke thriller, The Queen of Patpong, which took almost a year, and then – literally within an hour of finishing Queen – I started the second Junior book, Little Elvises. I wrote it in nine weeks. Books usually take me about ten months, so Junior obviously wanted to be let out. I'm halfway through number three, Muther's Day, right now, and once again laughing all the way through the book. You've already mentioned what you're working on, but do you have more exciting books in the pipeline, too? I'm writing two in addition to Muther's Day and I hope they're exciting - the fifth Poke Rafferty Bangkok book, tentatively titled The Fear Artist; and a book called Pulped, which is the first book in fifteen years in my Simeon Grist private eye series from the 1990s. I put the first four in the series on sale as e-books, and much to my surprise, quite a lot of people bought them. So I'm writing number seven in the series, only it's very, very different. Simeon's entire series has gone out of print and been pulped into newsprint, and when that happens to a series character, he or she goes to a sort of limbo, populated by the characters from other discontinued series. The limbos are organized like bookstores – by genre – so everyone in Simeon's world is a former fictional detective or cop – every kind of detective and cop ever fictionalized. The Simeon books were hard-boiled, but his best friend up there is the heroine of a series of cozy cooking mysteries. Anyway, one of Simeon's few remaining readers on earth is murdered, and he has to figure out what he can do about it from up there. I have no idea whether this is going to work, but it's what I want to write at the moment, so it's what I'm writing. And I'm having a GREAT time with it. That's a lot of writing! I knew I wanted to write in third grade. It just took me 30 more years to get serious about it. I knew I was a writer from the time I began my first novel, but unfortunately, I also knew I was a very bad writer. A million and a half words later, I'm better, but I'm still doing my best to improve. I work every day. I'm fortunate not to have to do anything except write in order to pay bills. I get up seven days a week, drink coffee, make an agenda for the day (I'm often writing one book and editing another, and then there's all that “life” stuff) and, when that's done, I go run for an hour or so, come back, shower, and go to work. I try to do 1500 words every day, even if they're junk. I learned a long time ago that the enemy is not the bad page. It's the empty page. By the way, there's a huge area of my website called FINISHING YOUR NOVEL that a lot of writers have found useful, including some who sell bettet than I do. It's here if you want to check it out. I'm a very fortunate person. I get to make a living doing what I love best in the world – telling stories. Tim, thank you so much for being a guest today. Your passion for writing shines through, and so does how much fun you're having. It's been a pleasure chatting with you. 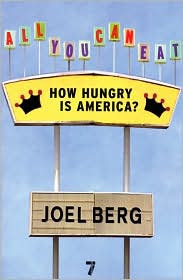 The Writer's Chatroom presents non-fiction author, hunger activist Joel Berg. The Writer's Chatroom presents thriller author Karen Dionne.